Transformers Earth Wars first introduced Power Cores in October 2017 as a way to enhance bots and base defense. As described by the developers, Power Cores can be used “for a strategic advantage in battle or increase the chances of a successful defense” of your base. Power Cores can be obtained through a special campaign called the Story of Nebulos which involved five battles and looks to educate the player on what some of the different Power Cores can do during the battles. By defeating all five bases you unlock the ability to build you Power Core Lab which then allows you to Equip, Manage and Fuse Power Cores on bots and bases. G1 Power Cores were added to the game in mid-2018. These Power Cores are specifically used by Generation 1 Transformers and are tailored to their abilities. When applicable we have worked these G1 Power Cores into the individual bot power core recommendations. 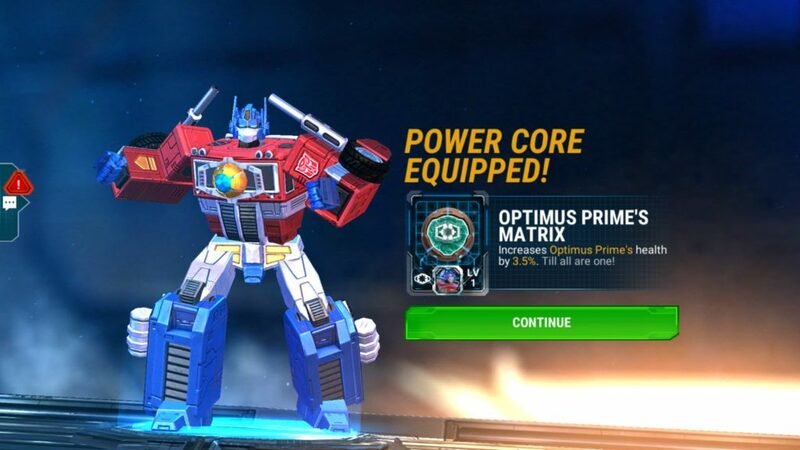 Prime Cores were added to the game in early 2018 offering the Power of the Primes to the bot who equips each. Currently there are 12 Prime Cores available in the game and Gaming-fans.com has put together a description of each Prime Core plus the best bot for each Prime Core for reference. Squad Cores are a new addition to Earth Wars in April 2019 which seem to combine multiple statistical boosts. For example, a Medical Command Flak Jacket for Autobots increases the healing done by the bot equipped by a percentage while also reducing damage by a percentage from Mortars and Missile Launchers for all the other medics, thus helping the squad (other Medics) as well as the bot equipped.